Anyone watching the World Cup Games has witnessed how great skill, great passion, and a great sport can lead to… some pretty gnarly injuries. After watching Argentina’s defender Pablo Zabaleta take a punishing header and lie bleeding from his mouth on the ground, we at Barrett Family Dental feel inspired to talk a little bit about sports and oral health! Ironically, at about the same time that your child may start to be more “serious” about her sports, she also probably has all or nearly all her permanent teeth— which means the stakes are higher if something happens to them! That’s why Dr. Barrett urges his patients to always wear a mouthguard when playing sports. Just like wearing a helmet each time you ride a bike, encourage you kids to wear a mouthguard each time they play sports– think of it has a helmet for your teeth. In fact, wearing a mouthguard that is well-fitted can provide some protection for your child’s head in the event of a head injury. Soft plastic mouthguards can be found at most pharmacies and generally are fitted to your child’s mouth by immersing in hot water, letting it cool to a comfortable temperature, and asking your child to bite down on the malleable warm plastic. A custom-fitted mouthguard can also be made at Barrett Family Dental; this type of mouthguard affords your child greater protection. If you’re not sure what type of mouthguard is best to protect your child, speak with Dr. Barrett at your next appointment (or call us any time!). While we all hope they won’t, sometimes accidents do happen. If your child, or another child, does get a permanent tooth knocked out (in dentistry, a knocked out tooth is called an avulsed tooth) in a sporting event, be the person on scene who keeps their head and knows what to do! Stay calm and find the child’s tooth. The best case scenario is to reinsert the tooth back into the socket and keep it there during transport to Barrett Family Dental. Do this by handling the avulsed tooth by the crown– this will save the roots from further damage. Your child can bite down gently on a piece of gauze to hold the tooth in place. If the tooth cannot be reinserted into the socket, yes, you really do put it in a glass of milk. Keep the tooth in the milk while you take both child and tooth to the clinic. Your child can also hold the tooth between their teeth and their lips– their saliva protects the avulsed tooth from further damage in the same way that milk does. However, be especially careful if this is the tooth transport of choice because method does introduce the possibility of swallowing the tooth. If an ill-timed and poorly placed softball swing actually shatters your child’s tooth, then there is a chance that nerve endings could be exposed. This is a dental emergency, and the child will need pain management immediately in addition to infection control. And in an interesting aside: one of the most common ways that children lose or damage their teeth is through fender-benders and other automobile mishaps– that’s another reason to make sure seatbelts are used– correctly– each and every time! It’s always a little chilling to discuss and plan for the accidents that you never want to happen in the first place, so please don’t take your child off the soccer team yet! In reality, wearing a $5 mouthguard from the grocery store or pharmacy will protect your child from almost any potential injury. The important thing is to wear the mouthguard. As we all know, Dr. Barrett is a stickler for preventative medicine, and mouthguards are another form of prevention. 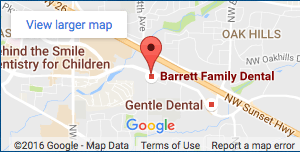 Our team at Barrett Family Dental, the best emergency dentist Beaverton has to offer, is committed to keeping your team player enjoying the game with a healthy smile!